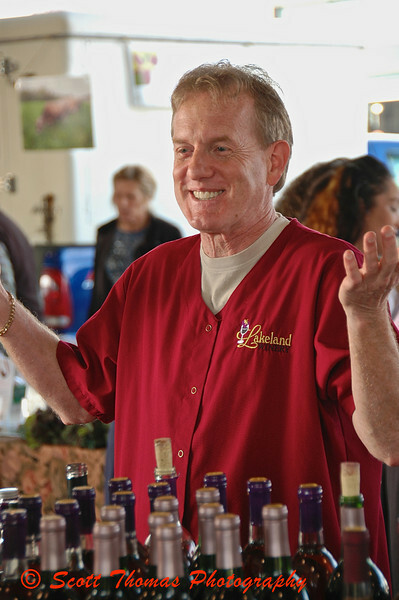 Andy Watkins, owner of the Lakeland Winery, at his booth in the Central New York Regional Market on Saturday, May 8, 2009. Andy Watkins was having a good time at the Central New York Regional Market on Saturday morning. The Market was very busy being the day before Mother’s Day with many people getting flower gifts for their Moms. Andy was giving out free samples of wine he produces at the Lakeland Winery and talking to any and all who would stop to try some wine or listen about his business. Andy is one of the people that make going to the market a treat. This entry was posted in People, Weekly View and tagged andy watkins, central new york, lakeland winery, new york, Photography, regional market, syracuse, wine. Bookmark the permalink. I think I need to find a market that has wine samples! That’s a fun shot…………..
Nice portrait. He seems to be enjoying the moment.